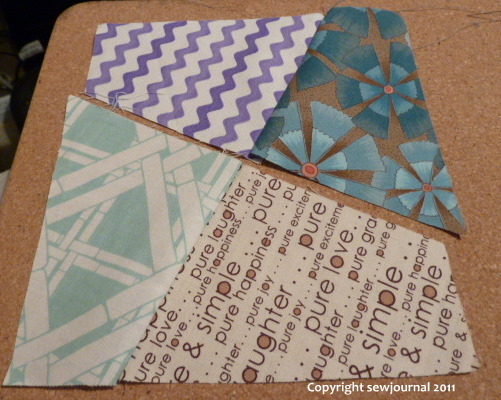 Here goes… First you need to cut pieces of each fabric you want to include in your quilt. [Edit: I used an OminGrid Offset Square Template like this. 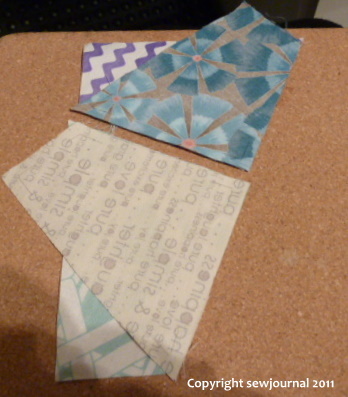 ]Then assemble them on a design wall in a pattern you find pleasing. 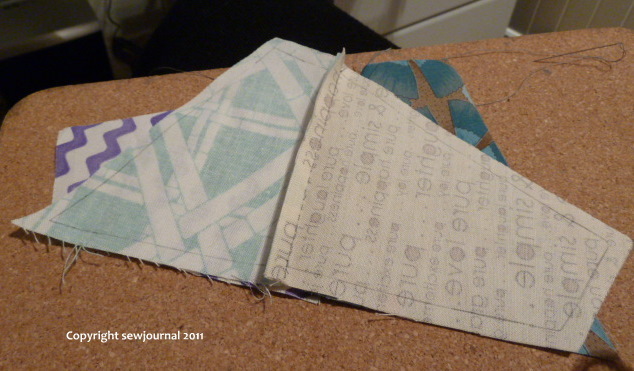 You will then need to cut some extra pieces of other fabrics to finish to edges and corners. Below is a picture of my design wall. 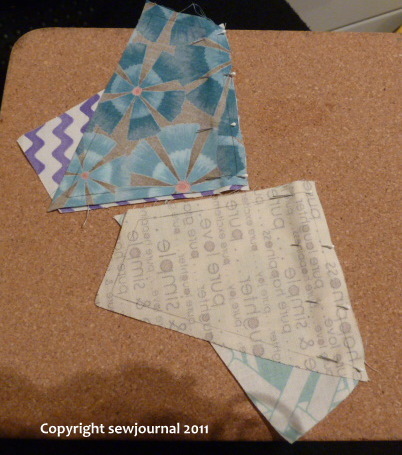 The red box shows you the next pieces that I am going to sew together. You see when you sew this together you don’t sew the four pieces of a particular fabric together. 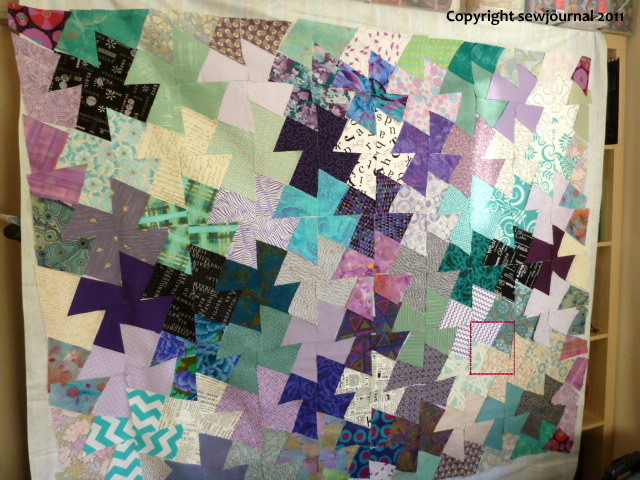 You sew pieces of four different fabrics together to for a square. I think the following photos are self explanatory. Take a look. 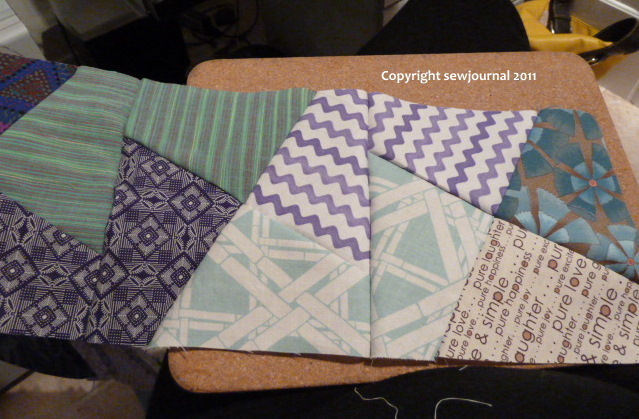 The next step is to sew these two halves together to complete the block. 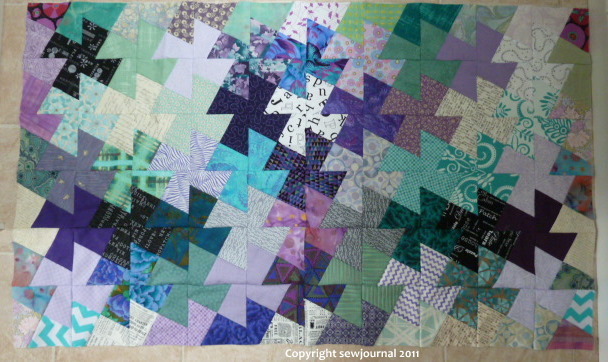 Once you have completed all the blocks in a row they can be sewn to the preceding rows. Here is a photo of where I’m up to now. I’ve completed 6 rows. If you have questions feel free to ask. I haven’t decided yet if this will be all or if I will add extra blocks to the outside some of which are plain so I can put a plain border on and make them look like they’re floating. I’ll keep you posted. Ummm did I miss whether you said about a template or pattern anywhere? lol Gotta forgive me, i’m a bit ‘blonde’ at times. Sorry about that I used an OminGrid Offset square template like this. I think the biggest point is the design wall or a place to keep those little pieces organized. 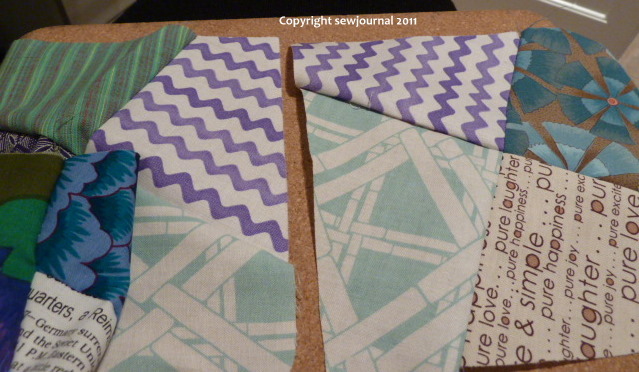 I like the fact that all you cut of each fabric is a square … no wonky scraps. Each time I do this, it is getting the parts in the right place that is so hard. I didn’t know the name of the pattern but I do like the results. I didn’t keep the pieces up on my design wall. 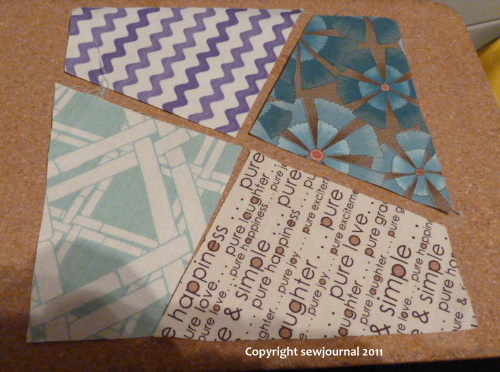 I took them down in “piecing square” order and laid the pieces one on top of another in squares. I took a photo of the design wall in case I ever got confused. I loved it when I saw it and also may piece it because it sounds easier than it looks. I like to show things that are easier than they look to get undeserved oohs and aahs.